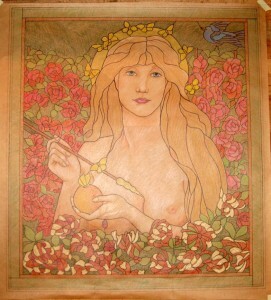 The goddess Venus is the subject of our most recent window commission. Based on a painting by Dante Gabriel Rossetti from 1864-68, the face and hair of the original oil painting have been altered to create a portrait window. We are in the middle of production on this piece, and thought we would post some of the process photos to show the progress. The first image is the drawing for the window, which is known as a “cartoon”. 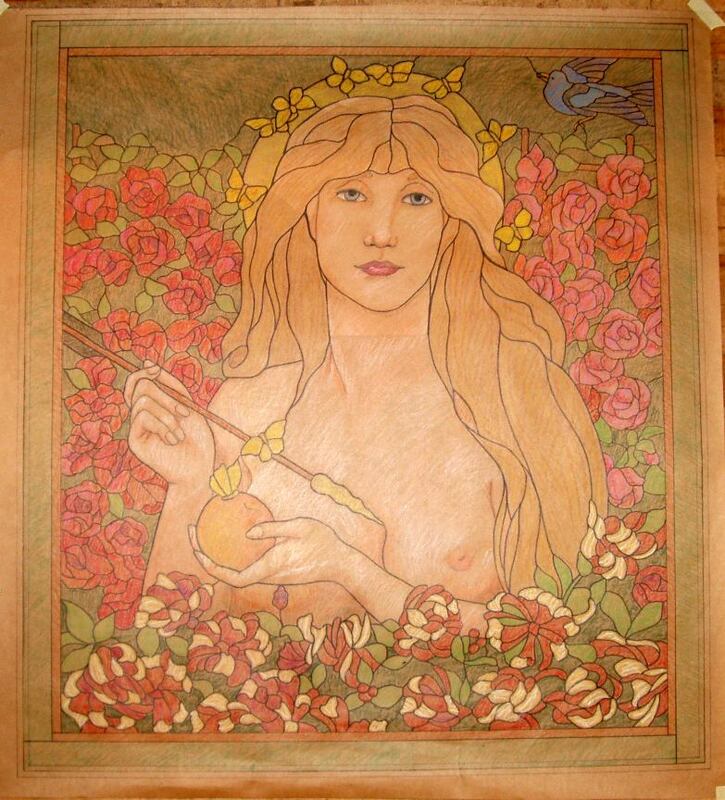 This hand-drawn, full sized rendering of the image is given a basic coloring and will be referenced throughout the production process. Two more matching cartoons are created from this drawing – one that is numbered and will serve as the template which we use for layout, and a second which is numbered and cut up to be used as a pattern as we cut the glass pieces. At the right, Irwin is cutting out the third cartoon in preparation to lay out the background and flowers. The painted areas of the window are created by Bill, who also drew the cartoon. He hand paints each piece of glass with powdered mineral-based glass paints then fires the pieces in a kiln to create the flesh tones and figural details. This process of creating images on glass takes time, talent and patience. 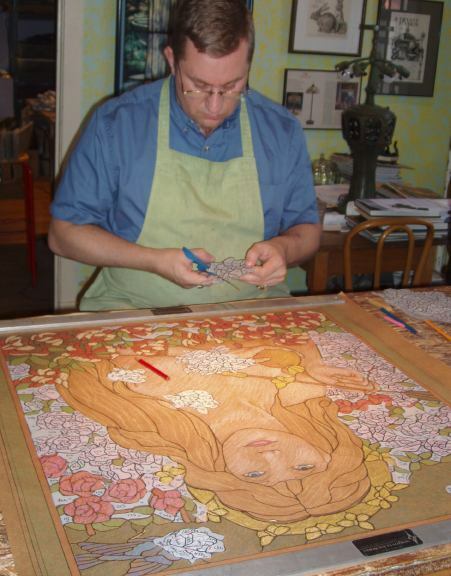 Each figural piece of glass is usually fired 3 – 5 times to complete the details and flesh tones. At left, Bill is hand painting the main body piece for the figure. 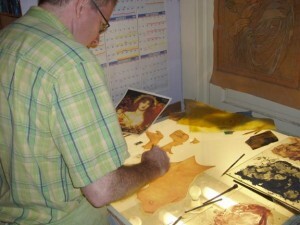 As you can see in the photo, he references a copy of the original oil painting while creating the details. 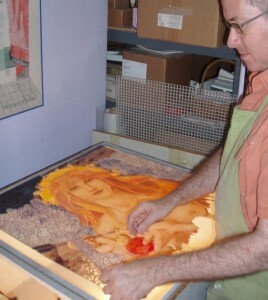 Bill is seen checking the painted figure on our light table after he has fired the pieces of glass in the kiln. Once completed, we will post photos showing the second half of the window’s construction.